Sri Dharma Mittra is the teacher with the most mileage and has been teaching continuously in New York City since 1967. A yoga master and Teachers’ Teacher, Dharma has trained thousands to disseminate the life saving health practices of yoga across the globe. He has run teacher training programs and workshops in Japan, Israel, Turkey, Colombia, Brazil, Spain, Mexico, Hong Kong, China, London, Germany, Switzerland, Canada, throughout the United States, as well regularly at Kripalu and the Omega Institute. Dharma is the senior instructor to all Yoga Journal Events throughout the U.S. A complete biography for Dharma can be found here. Director of Dharma Yoga Center since 1990 and founded the DY Life of a Yogi Teacher Training program. Born in Queens NY to a family of Holocaust survivors, she became a modern dancer and choreographer. Eva taught Dharma Yoga for Beginners, Yoga Basics Courses, children and seniors at the center since 1988. She ran the DY retreat center and Teacher Training programs upstate for 10 years before it closed. Eva now facilitates in all activities at our current location and all things “Dharma”. 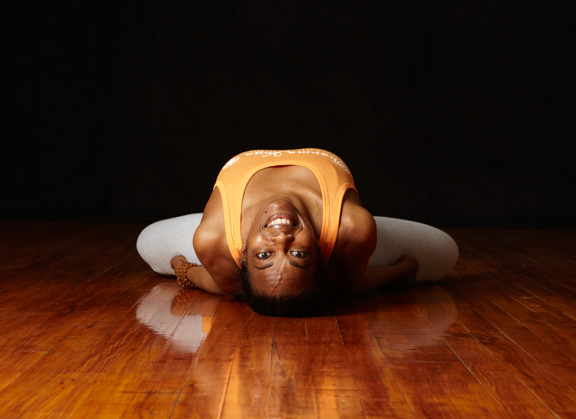 Athena began her practice of yoga in 2007 and did her 200-Hour teacher training certification six months later. A year-and-a-half later, inspired by a Dharma Yoga student, Athena went for the first time to class at the Dharma Yoga Center at 23rd and 3rd. She was catapulted to the physical, emotional, mental and spiritual heights that defines Dharma Yoga. Shortly thereafter, Athena enrolled in the LOAY 500-Hour Teacher Training and became a certified Dharma Yoga Instructor. Athena is humbled and thrilled to be passing on the knowledge that her beloved Guru has taught her. As well as teaching and subbing all Dharma Yoga levels, Athena is the Dharma Kids Yoga teacher. Jerome Burdi attended the LOAY 500 & 800 hour Teacher Training programs and is currently teaching the Master Practice on Mondays at 12pm. 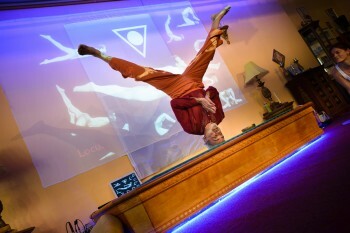 He discovered yoga during a shamanic retreat in Brazil in 2010. Since then, he’s been enveloped in the path of a yogi. He left his job as a newspaper journalist to go to Rishikesh, India, and become a yoga teacher. 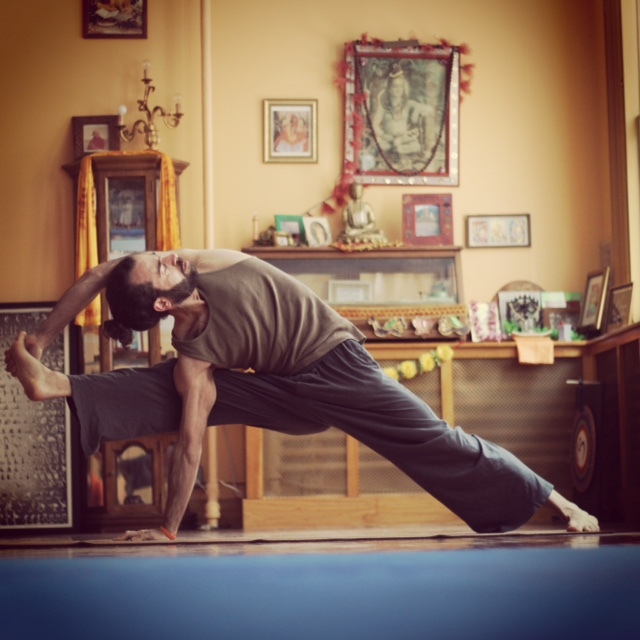 Upon returning to NYC, he discovered Dharma Yoga and has been hooked ever since. Though Jerome grew up in NY, he had to go to India to come back and see Sri Dharma Mittra with clear eyes and to hear the truth that is Dharma Yoga. Jerome’s mission is to spread his guru’s teachings. He is also a holistic nutritionist and a percussionist. You can also find him as a regular at our Tuesday Satsang programs, joining Sri Dharma Mittra and Adam Frei as an integral part of the DY Kirtan Band. Melanie was introduced to Dharma Yoga through regular practice with an incredible “Dharma Yogi” upon moving to NYC. She was inspired to attend the LOAY 200 hour teacher training and was fortunate enough to take over the roll of the LOAY Teacher Training Registrar a few months later. Now having completed her 500 hour training, she is honored and blessed to share the knowledge and teachings of Sri Dharma Mittra. She is currently teaching a Beginner’s level class on Saturday afternoons and enjoys making all aspects of Yoga accessible to everyone. She is so grateful to be a part of such a wonderful and supportive community. Everything is perfect. Melissa first started practicing yoga in 1996 while attending Penn State University from where she holds a B.S. in Special Education. Looking for a more spiritual aspect of yoga, Melissa continued to search for a teacher and knew the moment she took her first class with Sri Dharma Mittra that she had found her Guru and yoga home. Melissa is known for her devotional teaching style, encouraging students to connect with their spiritual hearts finding their inner truth and self. Yoga has become her life’s duty after meeting her teacher. Melissa has been fortunate to fully immerse in yogic life through Sri Dharma Mittra’s LOAY 500-Hour Teacher Training . She is extremely grateful to be a student and an assistant to a living yoga master. 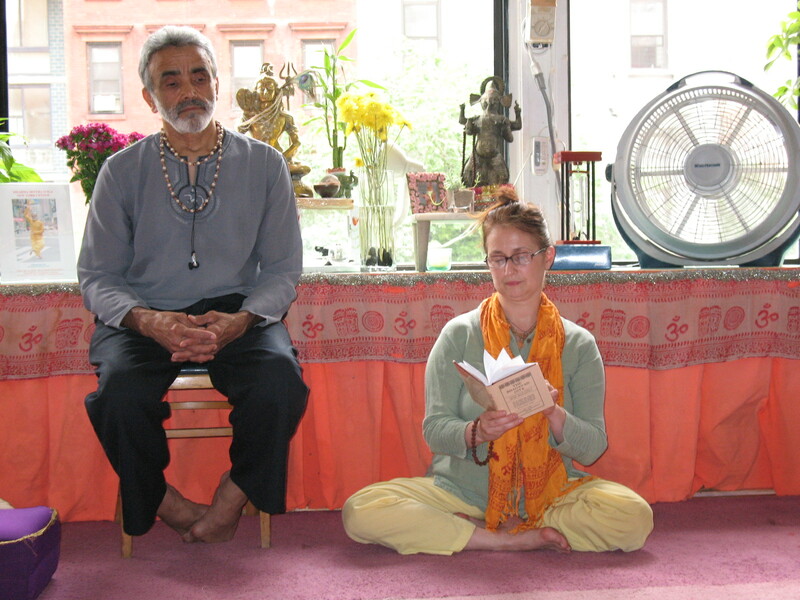 Melissa currently assists Sri Dharma Mittra as mentor in the LOAY 200 and 500-Hour Teacher Trainings. Her classes are filled with advanced Asana, scripture, chanting, Pranayama, Dharana, and Dhyana. She reminds students that the true purpose of Yoga is Self-realization. Jessica’s practice began with an exploration of different styles which eventually led her to complete a 200-hour Teacher Training in Costa Rica in 2007. Her mind is built eclectically from experience with various forms of dance, therapeutic massage and energy work, studies in philosophy and psychology, and shaped by instinct and self-realizations. She holds a degree in human biology from the State University of New York where she studied the brain and human behavior with a focus on the development of the innate human capacity for universal compassion and practical intuitive guidance. Although she originally became interested in yoga as a method of self-healing, it soon became clear that her understanding of the body-mind-spirit connection could impart a vital therapeutic quality to students in many walks of life. In January of 2010, she decided to attend a master practice led by Sri Dharma Mittra, immediately after which she realized he had essential knowledge for her on her yogic path. A synchronicity with Sri Dharma’s mission of expanding and deepening compassion (as well as cultivating human creativity and intuition) inspired her to study with him daily and to eventually become a Certified Dharma Yoga Teacher at the 500-Hour level. She is honored and humbled to share the teachings of this lineage with others who are seeking a realization of that true happiness and oneness of the divine within us all. Mark is the first certified Dharma Yoga teacher in the UK and founder of Dharma Yoga London, where since 2008, he has taught Sri Dharma Mittra’s Shiva Namaskar Vinyasa for beginners through to students of an advanced level and teachers. He strives to embody the qualities of yoga he has learned from his guru, Sri Dharma Mittra – humility, compassion, humor, selfless service and non-violence, and believes his role is to serve others through the practice of yoga, enabling students to become steadfast in their yoga practice and in their daily life. The teachings he shares are rooted in the classical yoga tradition. Students are transformed by these simple ancient teachings, which embrace all aspects of the science of yoga from the physical to the mental and spiritual levels. Gerson Frau lives in Brazil and is a loyal disciple of Sri Dharma Mittra. He travels internationally to teach Dharma Yoga workshops and to assist Sri Dharma Mittra in retreats and workshops. He is a mentor at the LOAY Teacher Training program. Penny came to the Dharma Yoga Center when it was known as the Yoga Asana Center under another dancer’s recommendation that it was a good place to start yoga. The first class she took was with Sri Dharma Mittra and she never left. She graduated from Sri Dharma Mittra’s first LOAY Teacher Training in 1999. She has studied dance for many years and is a dance teacher at a New York City public high school. Joann Stekler was born under the sign of Capricorn. She’s a native New Yorker originally from Queens, and works full time at the Dharma Yoga Center as front desk manager. She is a graduate of the LOAY 200-Hour Teacher Training of 2004 and the LOAY 500-Hour Teacher Training of 2006. She became a disciple of Sri Dharma Mittra in 2006. You can hear her at the desk often helping students, as well as being on staff as a substitute teacher for the Dharma I and Gentle classes at the Center.